The severe and unpredictable weather that often affects our area can cause significant damage to valuable trees and landscapes across the entire region. At Van Yahres Tree Company, we offer services that will reduce the potential for storm damage and help protect your property and landscape before the next storm strikes. In 1958 Van Yahres Tree Company learned the destructive power of a lightning strike first-hand. That summer the company shop in Cismont was struck by lightning and burned to the ground. Everything was lost but one truck and the tools that were in it. 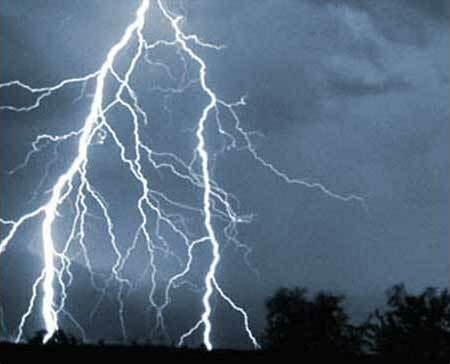 Lightning is a major cause of property damage and injury every year. VYTC began installing lightning protection systems in trees because they are particularly vulnerable to lightning strikes. Trees are struck far more often than other objects, in part because of their height, but also because their moisture content is a good conductor of electric current. The purpose of a professionally installed lightning protection system is to provide a specified path on which the lightning can travel. When lightning is drawn to an object the system takes the destructive power of the strike and directs it to the ground—leaving your trees intact. There are a great number of valuable, historic trees on residential properties, commercial properties and estates in Central Virginia. Protecting the long-term livelihood of trees is essential to what we do, and lightning protection in trees has helped us do this for our clients for more than 60 years. High winds and heavy snow and ice can break branches or cause limbs and trees to fall on your property. Pruning and Tree Removal are services that we provide to help prevent this from happening. Read more via the links below.